Mera’s journey is one of self-discovery. It’s summed up perfectly in one panel where she questions her path to her mentor and friend, royal guard member Hikara. “Isn’t that my choice? 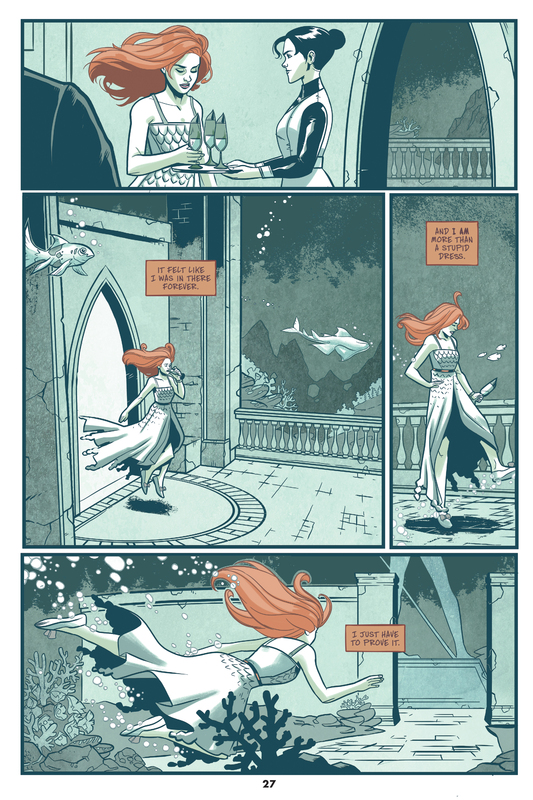 Don’t I choose who I am?” In this story, we see Mera’s rebelliousness and her selfishness. But ultimately, those are the hallmarks of a young woman trying to choose her own destiny.in the face of a path already laid in front of her. And yet, somewhere during her journey, the power of her own choice gets rushed and lost in the development of her relationship with Arthur. And while Mera is one of my absolute favorite characters and the relationship she shares with Arthur Curry is one for the ages based on mutual respect and love, the story seems to flounder as it tries to balance Mera’s choices with the iconic relationship. I wanted more from this book. It’s a great read and is a perfect way to introduce these characters to new fans, but those who already love the characters may be a little disappointed. The art is lovely and almost entirely focuses on Mera’s beautiful hair. The decision of the muted palette, with the exception of Mera’s hair, is striking in all the right ways. 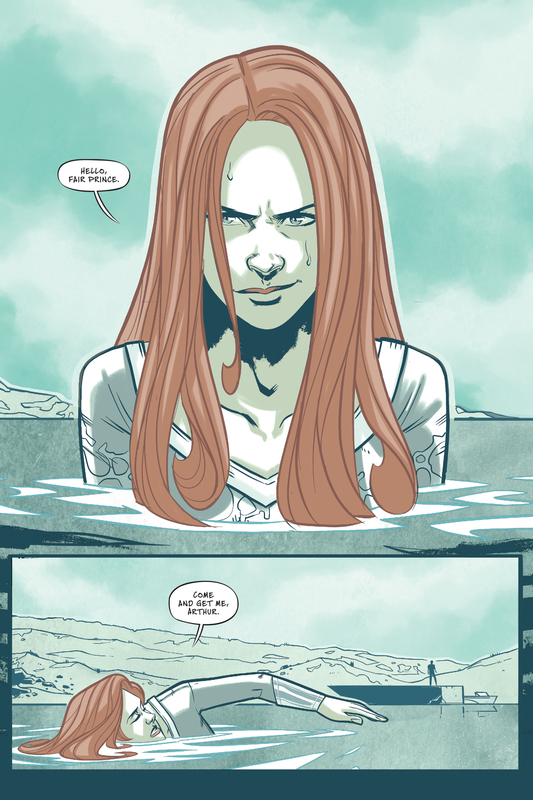 And the difference between her hair on land and underwater helps underscore the differences in the two realms. 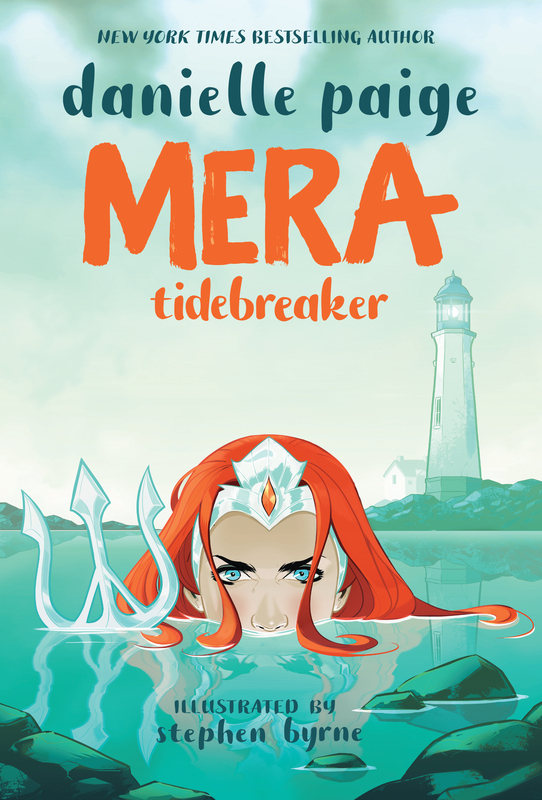 Mera: Tidebreaker is a great first entry and younger readers and new fans will find a way to fall in love with Mera and Arthur through this first DC Ink title. Dainelle Paige is the New York Times bestselling author of the Dorothy Must Die series, and the Stealing Snow series (Bloomsbury, 2016). In addition to writing young adult books, she works in the television industry, where she’s received a Writers Guild of America Award and was nominated for several Daytime Emmys. She is a graduate of Columbia University and currently lives in New York City. DC Ink is a new young adult graphic novel line from DC. The line will introduce DC’s most iconic Super Heroes to a new generation of fans with stories told by some of the most successful authors from the young adult publishing space. DC Ink titles will be standalone stories, not part of DC’s ongoing continuity, and completely accessible to new readers who have no previous knowledge of DC characters. The line will launch in April 2019 with the release of Mera: Tidebreaker by Danielle Paige and Stephen Byrne, followed by Under the Moon: A Catwoman Tale by Lauren Myracle and Isaac Goodhart in May, Teen Titans: Raven by Kami Garcia and Gabriel Picolo in July, and more titles to be announced.